“I’m sitting at this table called love, staring down at the irony of life. Wash and pat dry the squid tubes. Roughly chop up the prawns and sauté in olive oil for a minute or so. 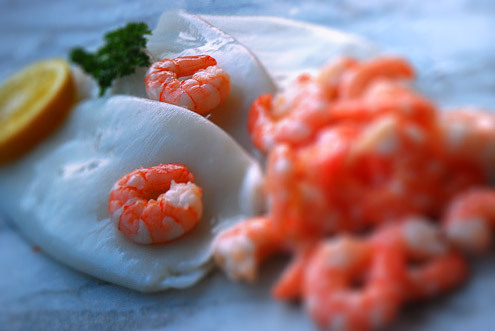 For the stuffing, mix together the breadcrumbs, parsley, egg and garlic, and then add the sautéd prawns. Add the lemon juice and season to taste. Stuff the squid tubes with this mixture and seal the open end with a cocktail stick. 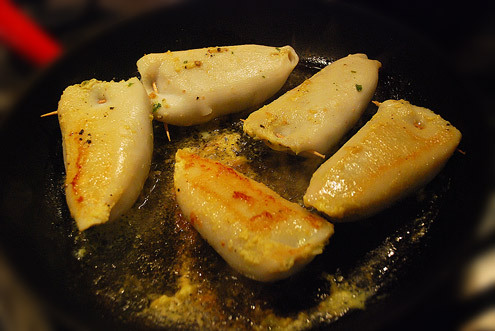 Heat some olive oil in a large frying pan and add the stuffed squid. Cook over a low heat for 10 minutes and then turn over. Add a splash of pastis, turn up the heat a bit and continue cooking for a further 5-10 minutes. Verdict: Well, if you like squid and you like prawns, you’ll love this. 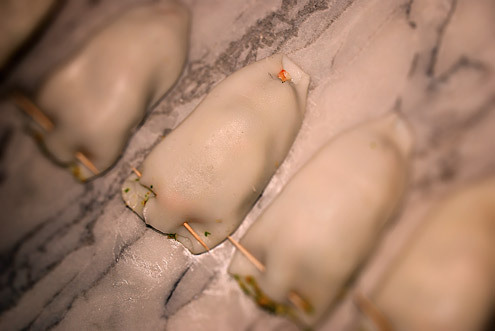 The squid is firm without being chewy and the pastis adds a nice little aniseed finish. Drink: Drying out after our Berlin trip. Entertainment: An episode of the excellent Flight of the Conchords* followed by a stupid film called ‘Wanted’.